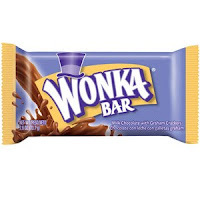 HF has just announced that the Wonka bar has been discontinued. (For now, Hometown Faves still has some for sale.) I can't think that I've ever eaten a Wonka bar, but surely, somewhere, someone is sad. Now if Wonka would only bring back Wonka Oompas, the split-level chocolate-peanut butter candy that did Reese's Pieces one better. Who's with me? YES! People thought I made that up ~ Bring the Oompas back!